Key Performance Indicators are quantifiable measurements that reflect critical business success factors for the company, maintenance department or special project. When using computerized maintenance management software (CMMS), it’s important to be able to track goals. CMMS KPIs (Key Performance Indicators) give maintenance professionals a mechanism to measure success. All those who wish to improve their bottom line should be using some form of KPI or measurement process—whether it be a single individual or a large organization. For an individual whose goal is to lose weight, their KPIs may be waist measurement, number of pounds lost or the ability to fit into jeans they wore in prior years. Similarly, each organization has specific measurements it uses to gain meaningful insight into its overall performance. From an organizational standpoint, Key Performance Indicators should be identified after a mission has been defined, stakeholders are identified and goals are established. KPIs are generally long-term and do not change often. However, an organization may modify their KPIs as it gets closer to achieving those goals or if its goals change. Although goals and KPIs flow from top to bottom, achievement of those goals flows from bottom to top. It’s important to establish KPIs that can be influenced by both the team and individual; failure to do so will result in frustration. All levels of an organization should be able to take part in the development of relevant KPIs. And once created, KPIs should be visibly posted for employees to see at all times as they complete their everyday tasks. Doing so helps keep big-picture goals in the forefront of everyone’s minds, and serves as a reminder to continually report on KPIs. Key Performance Indicators allow us to learn. In order to learn how heavy an item is, you weigh it. To find out if a piece of equipment will fit into a desired space, you measure it. Measuring maintenance is no different. When measuring KPIs, work is never completely done. You must determine what to measure, calculate KPIs, report and analyze results, take necessary actions and then measure again. Effective maintenance enables greater equipment reliability and lower operational risks. There are two types of maintenance measures: those that improve maintenance effect on business performance and those that drive good reliability behaviors. Furthermore, there are different categories of KPIs, including leading and lagging. Leading KPIs measure how an organization is performing now, while lagging KPIs indicate how an organization has performed in the past. It’s important to track both leading and lagging KPIs in maintenance, as both contribute to measuring an organization’s overall success. Mean Time Between Failure (MTBF) is the average time elapsed from one failure to the next. In simpler words, it’s the average time that something works until it fails and needs to be repaired again. MTBF is derived from taking the total uptime and dividing it by the number of breakdowns. This is an important CMMS KPI because it aids in identifying problem assets. Pictured Above: Mean Time Between Failure (MTBF) graph Component in iMaint Dashboard. This example was broken down by Craft (or the type of job such as mechanic, plumber, electrician) in order to determine which types of issues occur the most. Pictured Above: Mean Time to Repair (MTTR) graph Component in iMaint Dashboard. This example is broken down by Equipment ID to identify which one is the most problematic. The MTBF and MTTR graphs are two of the many graphs that refresh data real-time at user defined intervals. 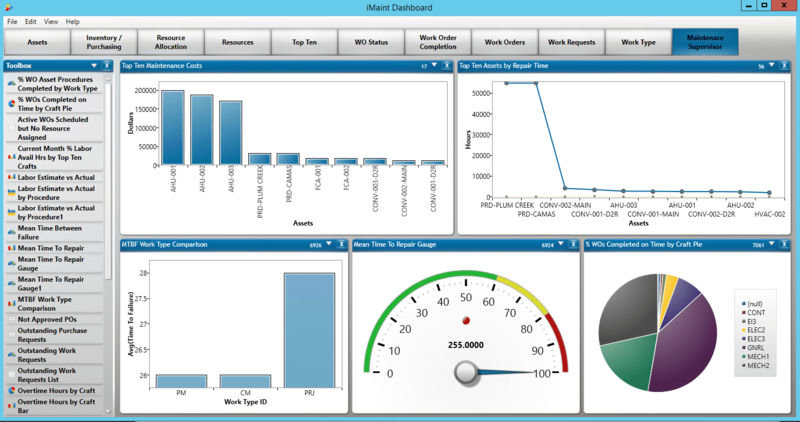 iMaint Dashboard users can display up to six components at one time. Including a comprehensive mix of both leading and lagging KPI graphs in a dashboard enables an organization to see how its performance is stacking up against its goals. Pictured Above: A snapshot of how your iMaint Dashboard may look. Every organization should use Key Performance Indicators. Continually measuring CMMS KPIs gives companies a mechanism to identify opportunities for improvement and enables future growth. DPSI has developed a range of CMMS products to help companies optimize their maintenance operations. With software solutions like iMaint, a company may access their CMMS from the office or anywhere in the world. To get started with a free demo, contact DPSI today.